I have begun to make it a secondary mission of mine to find all the unique and cool moto shops here in BCN, and wherever I manage to be. Along the way, I have seen a couple of neat shops, but this one is by far my favorite. While I've never been a true Ducatisti, I have always respected their product, and moreso, the passion and style with which they were created. Truth is, I love everything on two wheels, but I had never really worked on Duc's, so I was always a little intimidated by them because the higher spec they were, the more "spaghetti" was strung along the frame! My personal tastes run towards the minimalist side, which is why I love super-motards, old-school chops, cafe-racers, and thoroughbred racebikes! Oh, and I have a huge soft spot for the MH900E. 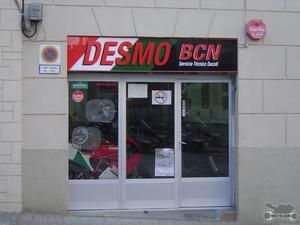 Desmo BCN is run by a single mechanic named Chencho, and although it's small, this shop is filled with all manner of goodies. The shop, and several of it's customers, have been racing for more than ten years, and they specialize in endurance races. 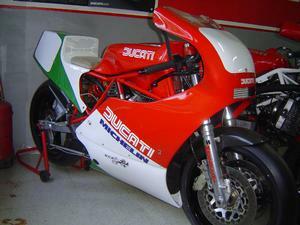 I don't know about you, but anytime a high-strung Ducati makes it through a 24 hour race, I know the team behind it (i.e. the crew), is top notch. I caught a couple metros (subway trains) to get here, and then had to walk for another twenty minutes before I found it. I also managed to walk right past it, but I caught myself before I got too far, and only ended up going an extra two blocks. With a nice clean shop floor, and three lifts, this is a great place to get service and custom work done. The tools are hung neatly on wall racks, and in general, I had a really good feeling hanging around - which is unusual for me. In fact, I started getting really pumped and excited, because I miss wrenching! 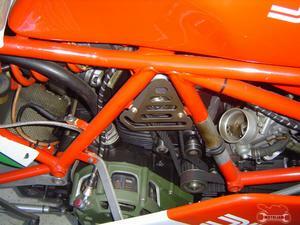 One of the racer/customers, Alberto, was inside prepping his 998 racebike for an upcoming event. Between his English (which was better than my butchered Spanish) and some concentrated pointing, we were able to communicate quite well. We might not speak the same language, but we both speak Moto. I had fun examining his baby, and he guided me through a small tour of the store. Unlike many shops I've been to, this place didn't even sell a single t-shirt, much less any other apparel! It was strictly moto, which is fine by me! I've started posting slightly larger pictures to see if I like it, and also because I want to make sure some of the things I capture in the pictures make it through to some of you. Who can tell me what's on the shelf on the right? Huge bonus points for anyone that gets it - and more photos, of course! 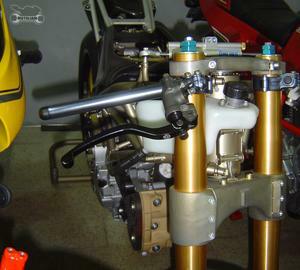 This girl had golden tresses, or should I say, this beauty had a magnesium valve cover on her race head. Look at the size of that lower triple clamp! Those Ohlins aren't going anywhere! 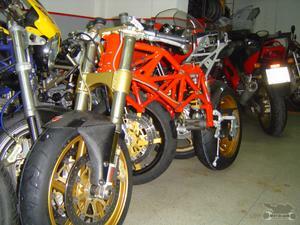 Little known fact: the Italian company Verlicchi makes the frames for both the Ducati Superbikes, and for Buell. Go figure, as both companies are teased by inline four lovers as having "tractor" motors. I have to disagree, as I prefer to call them "traction" motors. . . gimme that Torque, baby! Yet another rarity! 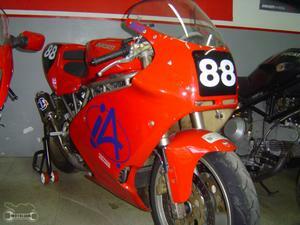 A late-eighties Ducati Paso racer (actually, I'm not sure if it's an 888, so for now, I'll guess it's a Paso, haha)! Wow! I hadn't seen one of these before, and it was fun for me to crawl around. 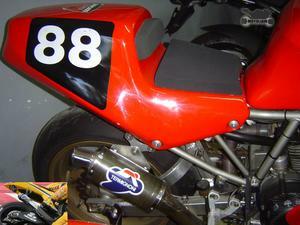 From it's stubby pipe, to it's full bodywork (this is regarded to be the first sportbike to "sport" full bodywork), it was magnificent. Alberto tells me it handles like a dream, corners like it's on rails - very neutral steering and easy to ride. I wish I could take it out and see for myself. Unfortunately, I wasn't able to get into the guts and see if it had the popular Weber Carb conversion, which the American versions needed to run well. If I remember correctly, you can still pick these up for a song (sub $3500) but you gotta make sure the bodywork is in good shape because it's getting scarce. . . . Think Termignoni started making 'shorties' for the Yamaha M1? Think again! My second favorite racebike in the shop. Suede seat, glass-fiber full cell, gorgeous machine full of heritage and history. Who can tell me what this is? Winners get a custom wallpaper emailed from me of something cool! The goods. Watch out little birdy!